For some unknown reason, I (as well as many other) like to set my currently playing track as my status in Gtalk and other IM clients. In Windows, with Gtalk and Winamp, this can be done done very easily. (From Winamp 5.5, there is a bit of problem.) But in Linux neither the GTalk client nor Winamp is available and the most commonly used IM client is Pidgin and music player Amarok. However, Pidgin does not come with a “Currently Playing” as a status option. 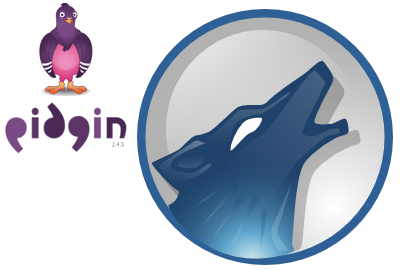 Here we will see how to do it with Pidgin+Amarok using an Amarok script called AmarokPidgin. Download the AmarokPidgin script here. 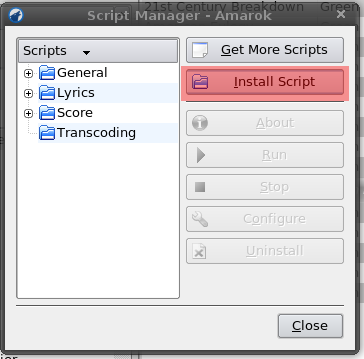 In Amarok, click on Tools->Script Manager. 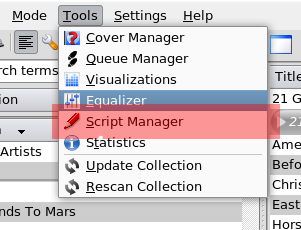 In the script manager window, click on Install Script and choose the downloaded file. Click Open. Open Pidgin and you should be able to see the currently playing track as “Media”. Now that the script has been installed, there are plenty of other options that you can play around with. Ideally, the configuration options should be available on from the Script Manager by clicking on Configure. However, that does not seem to work. 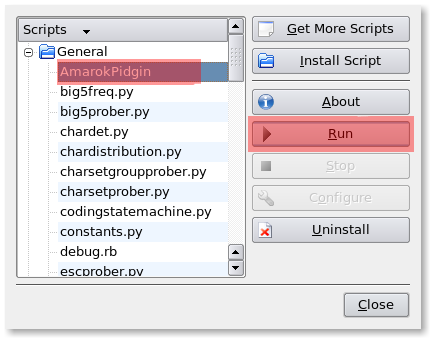 To do this manually, go to ~/.kde/share/apps/amarok/scripts-data/ and open the file AamarokPidgin.ini. Here is what you will get on opening the file (the default values). There are plenty of configurations that you can do. However, we give you a few here. To Update Your Buddy Icon (Avatar) with the Cover Art of the currently playing album, set the value of “cover_icon” as “true”. Note that this will only work if Amarok has the album cover art. To Display only the Artist/Album/Track Name, set the value of “status_message” as “$artist”, “$album” or “$title”. To revert, change it back to "$nowPlaying". To Display Lyrics, set the value of “status_message” as “$lyrics”. This will however display only a single line of the lyrics and Amarok needs to have the lyrics beforehand. To Censor Words, set the value of “censor_words” as the censored word. Multiple words can also be enetered but they have to be seperated by “|”. Then set the value of “censor” as “true”. In this example we have censored the words teddy, pokemon and laptop. To Update The Nick Instead Of The Status, change the value of display to “nick” from “status”. To revert, change it back to “status”. If you have any problems or anything that I've mentioned above is unclear, feel free to mention it in the comment.